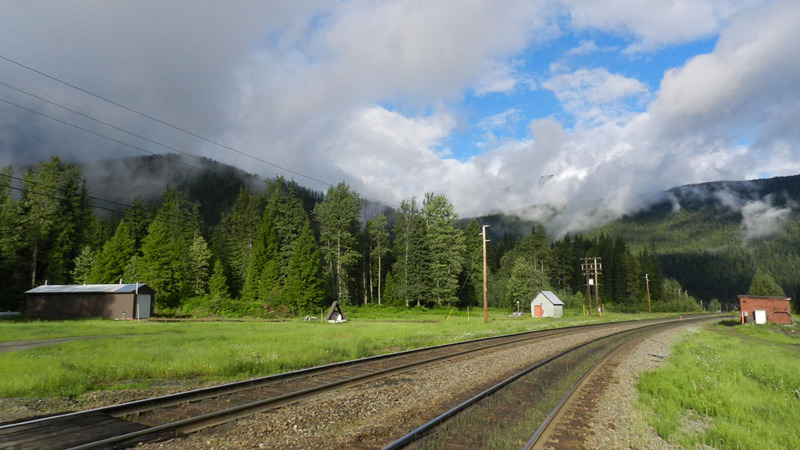 On the first morning, and after my best nights sleep in years, I walked down to the bottom of the resort and across the broad curve in the tracks that lead to Revelstoke and on to the coast. Much has changed since this was a ‘stop along the way’ and passengers were let off to enjoy the views of mountains, forests and raging rivers. Things have changed as well from the days when pushers stationed here worked to move trains up to Glacier and Rogers and provide breaking for trains following the Illecillewaet River to the Columbia. Above, from left to right across the field of view, is what looks like an engine house. The west leg of the original Y leads up to and into the large garage type door that is wide enough but nowhere near tall enough to house a small engine. Or even a modern boxcar if my measurements were right. A flat car or a gondola filled with tools and other equipment would fit. Maybe in support of snow clearing but those tracks hadn’t been used during the summer. A little farther west is a wooden tent like structure that obviously protects a propane tank from the worst of winter. A small, well-maintained aluminum house is home for something needed relatively often judging from the pathway to the door. On the far right, across the tracks, is a long, low 5 or 6 door speeder shed. I’ll call it that for want of something better but that’s what it looks like. It sits on what would have been the foundation of the original Albert Canyon Station.